Today’s local pick in the 2018 PopCult Gift Guide is a tremendous value. For a mere fifteen bucks you get two albums by one of West Virginia’s premiere songwriters and musicians, Todd Burge. One is his very first album, recorded in 1986 and unreleased until now, and the other was recorded just a couple of months ago. “One was recorded a few weeks ago and the other a few decades ago. Simply put, the new one is an acoustic album, and the old one is a rock album. This is a long story and I’m hoping you’ll follow me online or better yet, go to one of my shows so I can tell you more about it, but for now…..
“Todd Burge (1986 The First Album) was recorded while I was still attending West Virginia University back in the mid-80s. I got signed to Hardway Records in California, they paid for me to record an album, the deal fell through and I didn’t own the recordings. As a result, it was never released. It bothered me for years as I loved the album. I was kindly sent the master tapes last year (31 years later!) by the owner of Hardway Records, Randall Arlett. Listening to what the 20-year-old me wrote and sang about is interesting and fun for me now. It’s almost like an out of the body and brain experience. Even back then I was writing personal songs as well as character based songs like Cavewoman, which is about a mouth breathing sexist. I’m proud of the 20-year-old me. This is a rock record and to me it represents a sonic segue between my two bands The Larries, and the much heavier 63 Eyes, who still play a bit to this day. I jujst got my copy of the two-fer CD yesterday, and haven’t had time to fully digest it. You can expect to hear several tracks from each album in the coming weeks on Radio Free Charleston. 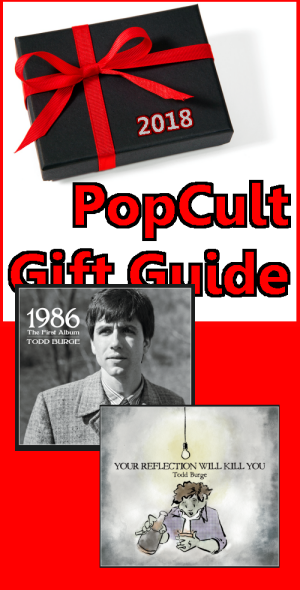 This is the perfect gift for any fan of Todd’s, or anybody who appreciates clever songwriting and great music. You can order it from Todd’s Bandcamp page, or check to see if the local record stores have it in stock. It’s a winner.